By the same token, I’m sure some scientist could explain how the molecules in peanut butter and jelly can combine with a half-ground beef, half-ground bacon hamburger patty to bond with the receptors known as the taste buds to trigger all sorts of pleasurable chemical releases in the human brain. Instead, I’d rather bite into a Peanut Butter and Jellousy at Slater’s 50/50 and let those chemicals wash over my synapses. Slater’s 50/50 is a national treasure that proselytizes the first commandment of Heaven is a Buffet with a pilgrim’s zeal. I visited the original location in Anaheim Hills in 2010 and gorged on one of those beautiful half-beef, half-bacon patties, but I wasn’t quite ready to have my mind blown. That 2010 burger was topped with bacon, sautéed mushrooms and cheddar. It blew away every other burger I’d eaten, because all-beef burgers simply can’t compete with half-bacon burgers. 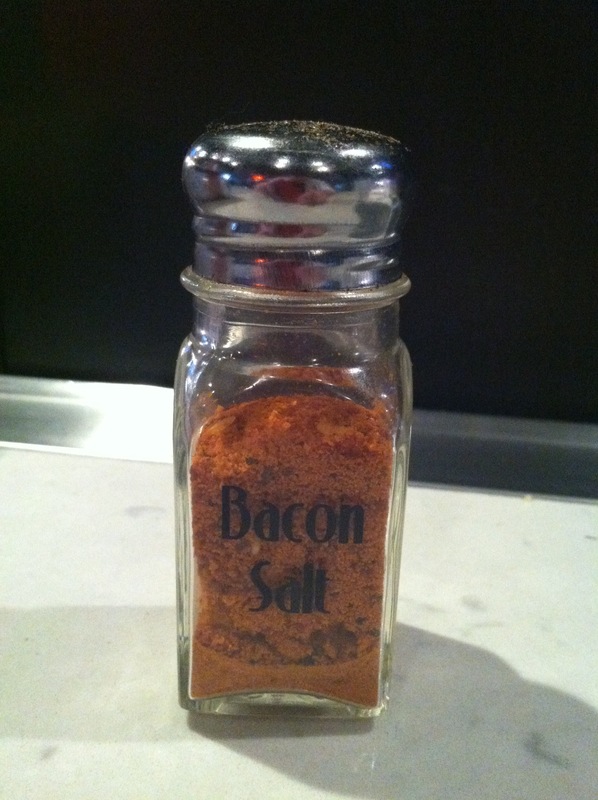 The bacon doesn’t make the burger taste like a BLT. Strangely enough, it multiplies the flavor of the beef. If all other burgers are cow, then the 50/50 burger is 10(cow). This week, I had planned to order another 50/50 patty with conventional toppings. Then I found myself at the bar at the Slater’s in Huntington Beach. I couldn’t sample more than a glass from the 80 beer taps because I had to drive, but on the menu I found a legal way to enter an alternate reality. Peanut butter and jelly on a burger. The Slater’s menu calls for this concoction on an all-beef patty. 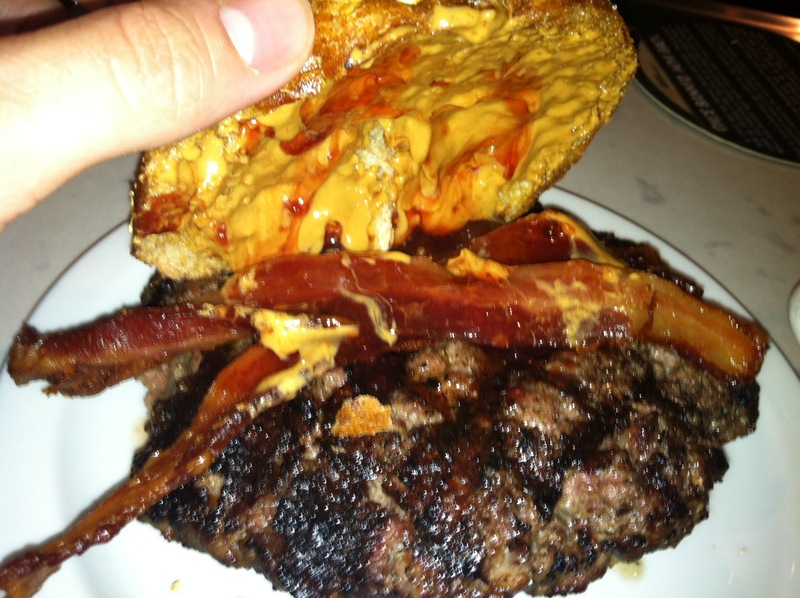 While the burger is 100 percent cow, ordering the Peanut Butter and Jellousy this way is only a half measure. Do not stop there. Order it on the one-pound 50/50 patty and experience the full range of bovine/porcine sensation. The first bite explodes on the tongue. The bacon and beef hit first, but then what’s that in the back? Savory, satisfying peanut butter – with just a hint of sweetness from the intentionally small dab of grape jelly. This should be disgusting. It should elicit some grotesque visceral response. But it doesn’t. Instead, it satisfies every conceivable craving all at once. Just as I can’t explain the movements of a proton, I can’t explain why this works. It just does. And we’re all better off because of it. Pre- and post-meal workouts: I’ve been lazy about including my workouts lately, but I can’t stress this enough. Do not eat this burger or anything like it if you aren’t exercising regularly. When pursuing deliciousness, some training is required. On the day I ate the Peanut Butter and Jellousy, I did an upper-body weight circuit in the morning and spent an hour on the elliptical machine that night. 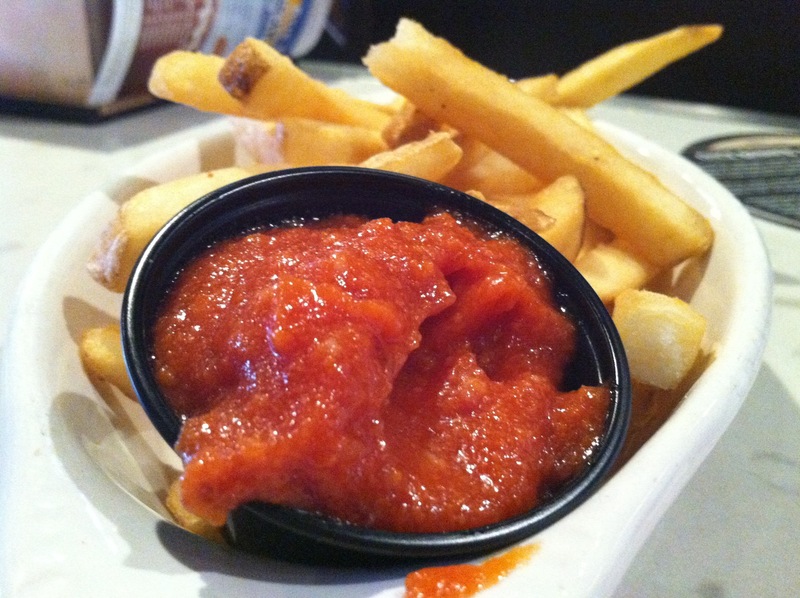 There’s bacon in that thar ketchup. 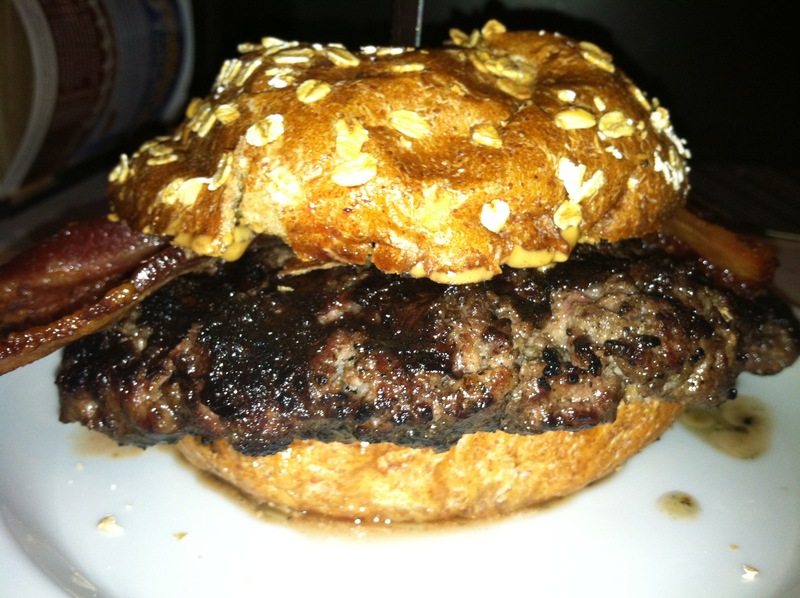 This entry was posted in Bacon, Burgers and tagged Burgers, Orange County Restaurants. Bookmark the permalink. Thanks for the earlier article about Slater’s. It’s been well worth going to. This seems more like something up Randy Staples’ alley. . .